Atlantis 150 Hand-Held Two-Way VHF Marine Radio - Floats / Submersible / Weatherproof | BUDK.com - Knives & Swords At The Lowest Prices! 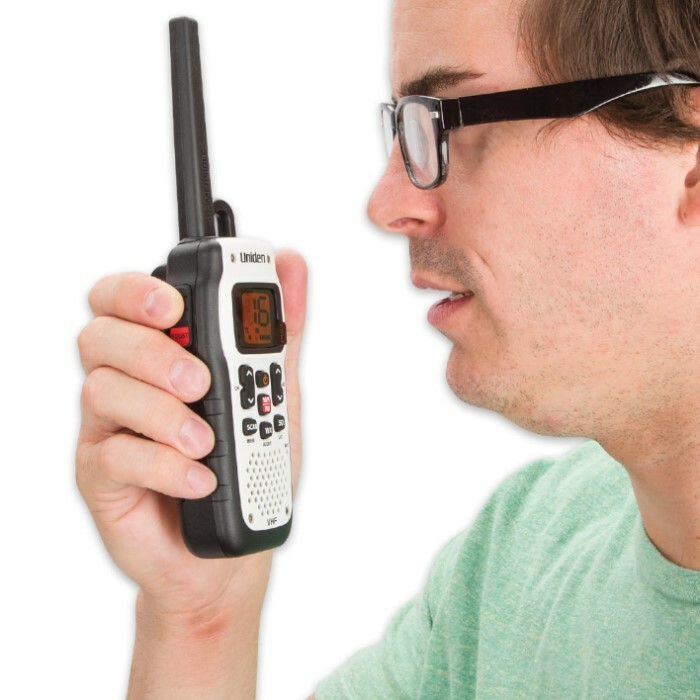 From rough seas to smooth sailing, you need a marine radio you can count on, and those from Uniden, like the Atlantis 150, have passed the toughest reliability tests of all - decades of real life use in the harshest marine conditions on the planet. When your life depends on it, depend on the Atlantis 150! 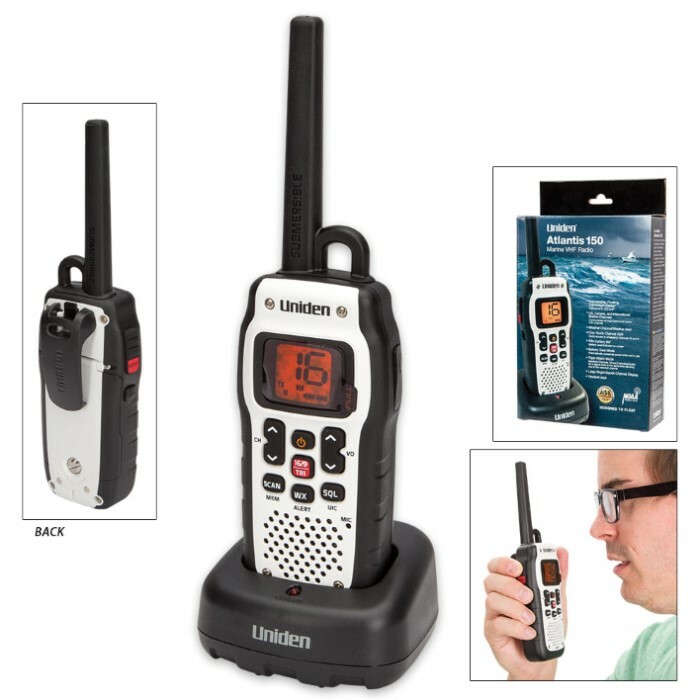 This powerful yet affordable hand-held two-way VHF radio is loaded with the features mariners need most when they’re out on the high seas - weatherproof construction, marine weather monitoring and alerts, dependable long range communication, one-touch emergency channels and so much more! With an International Protection Standards rating of JIS8, you can rest assured that even continuous water submersion can’t stop the Atlantis 150! It's also designed to float, so you can use the Atlantis 150 during torrential downpours, deck-soaking wave swells and practically any other extreme weather conditions. 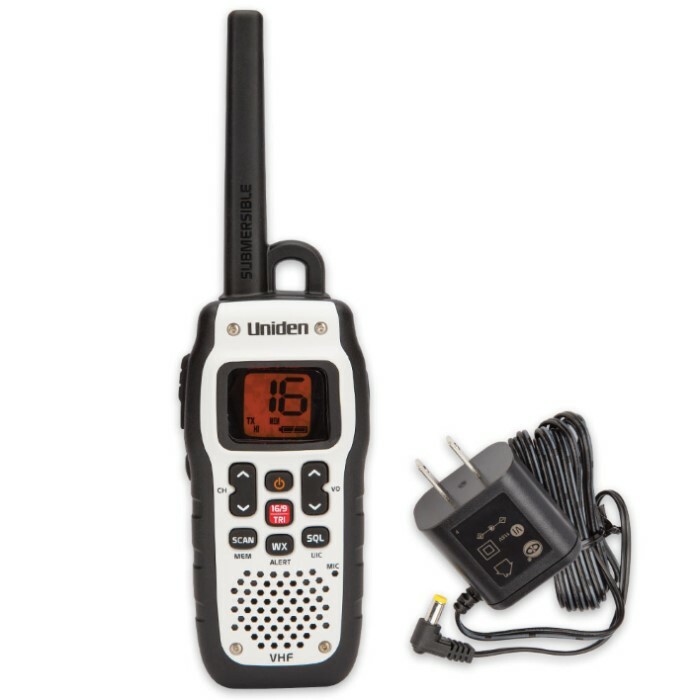 Easily stay ahead of bad weather with the Atlantis 150's NOAA weather channels and handy hazard alert feature. Weather Alert Watch mode mutes the radio while it monitors a preset weather channel, then sounds an alarm if there are broadcasts on said channel. For staying on top of varied hazards and distress situations, switch to Triple Watch mode. This all-important setting monitors channels 16 and 9 (the most critical marine communication/emergency channels) simultaneously for a signal while at the same time allowing you to use/listen to a third channel selection that you choose. The Atlantis 150's not all about alarms, danger and distress however! With a long 10-12 hours of battery life and an extensive range driven by an impressive 2.5W/1W (Hi/Lo TX settings) of transmission power, it's also great for casual communication with fellow boaters - in a fishing armada, a sea kayak convoy or countless other on-the-water applications. Recharge the Atlantis 150's NiMH battery with the included charging cradle, and have fun and stay safe on the water again and again! Atlantis 150 Two-Way Radio, belt clip, rechargeable NiMH battery, charging cradle, AC adapter, owner's manual and other printed materials.